TOKYO (AP) — A U.S. Navy helicopter crashed on the flight deck of the aircraft carrier USS Ronald Reagan on Friday, causing non-fatal injuries to a dozen sailors, the Navy said. All affected sailors were in stable condition and their injuries were non-life threatening, the Navy said, adding they ranged from minor abrasions and lacerations to fractures. The most seriously injured were airlifted to a hospital in the Philippines, it said. Families of the injured were notified, the Navy said, while the carrier resumed flight operations. Lt. Cmdr. Matt Knight, the Task Force 70 spokesman, told Stars and Stripes newspaper that four crew members were aboard the helicopter when the crash happened. He said 12 people were injured and the carrier sustained minimal damage. 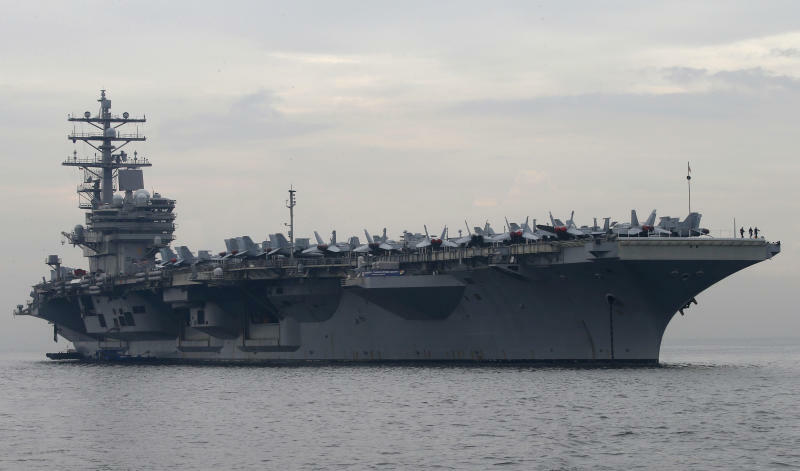 The crash occurred while the Ronald Reagan Strike Group was conducting routine operations in the Philippine Sea, which spreads north and northeast of the Philippines. The cause was under investigation. The carrier participated in the international naval review hosted off the South Korean island of Jeju last week.